I was searching Lil Bear (Petit Ours) everywhere for to put him in his cage before to go to work. Finally he was on my bed in this little tente with Nahum's favorite toy. Lil Bear never sleeps in there, it is very rare. Adorable, you did a good job. Vraiment cute cette petite aventure ... commencerait-il à se sociabiliser un peu plus ? En tout cas il est bien mignon ... blanc comme neige. Attendrissante photo de Petit ours avec ce jouet . . . . c'est adorable . . . .
et . . . un grand MERCI pour toutes tes pensées . . .
Aww. he looks like a baby. I love his sweet pink nose. Awe...that is so cute! And how ironic, my little baby Spencer who was also an albino, had a stuffed cow. He would hide it so well! Behind the tv, or sometimes stuffed between the tv and the wall. Great pic, overall. It's sooo cute. His fur looks so soft, and you captured it well. You're very welcome. Awe...a DEW, I think they are so pretty! They are popular, those cows! Yukkabelle, your ferret is beautiful owo!!! This white little ferret is Lil Bear or "Petit Ours" in French. And on the picture Lil Bear is sleeping with Nahum's toy. Don't be sorry, I love to see Nahum still loved by everybody. That is too adorable... Your Lil Bear is just the cutest little thing. 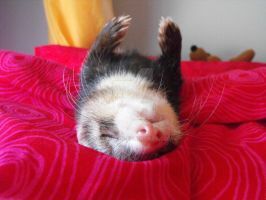 Aww, a tired little ferret!